What is an Ohio Promissory Note? Ohio Promissory Note: What Is It? An Ohio promissory note is a written contract between a lender and a borrower. The purpose of the document is to act as legal evidence of a loan given and an agreement to repay it. There may also be a co-signer involved. If the borrower doesn’t repay the loan as agreed, the co-signer may be held responsible for it. Ohio promissory notes may be secured or unsecured. A secured Ohio promissory note provides the lender with the ability to collect collateral if the borrower does not pay as promised. The most common form of secured promissory note is a car loan. If the borrower does not comply with the terms, the lender repossesses the vehicle. An unsecured promissory note is a signature loan. There is no collateral. What Is the Maximum Interest Rate That May Be Charged in Ohio? The maximum amount of interest that may be charged in Ohio on loans valued at less than $100,000 is 8%. If the loan is over $100,000 or if there are certain types of collateral involved, the interest rate may be higher. To learn more about the exceptions and the legal amount, read OH ST § 1343.01. To write an Ohio promissory note, consider whether the note is secured. If it is, make sure the word “secured” is used in the title. For example, Ohio Secured Promissory Note or Secured Ohio Promissory Note. Without acknowledging the fact that the note is secured in the title, a legal dispute may cause the court to hold that the note is unsecured. List the date the Ohio promissory note is created. This date, along with the date that the agreement is executed, should be formatted as month, day, and year. The dates in the document help prove that it’s a valid agreement between the parties. The dates also help determine specific deadlines for legal action. Identifying each party in the agreement as well as their role. Next, list the legal name of each party and their role. This includes any co-signer. For example, Joseph Q. Doe, Borrower. List the mailing address for each party. When listing the mailing address, it is important to use the city, state, and zip code. If the note is secured, list the physical address for the borrower and co-signer if it is different from their mailing addresses. For lenders with a mailing address and a payment processing address, list the payment address with the payment terms. The amount loaned to the borrower. This is generally referred to as the principal loan amount. It does not include the amount of interest charged for the loan. Interest is addressed separately. Before executing an Ohio promissory note, make sure that this amount is correct. The interest rate charged on the loan. This is often expressed as the annual percentage rate (APR), per annum, or yearly interest rate. The maximum amount that may be charged in Ohio for loans less than $100,000 is 8%. How the loan will be repaid. The repayment agreement or payment agreement explains how the borrower will repay the loan. 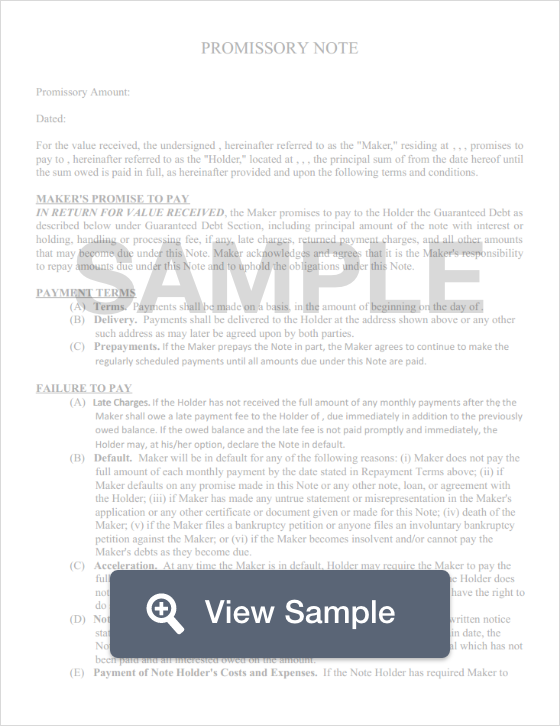 This section includes the number of total payments that must be made, the amount of each payment, and the due date for each payment. If a late fee will be charged for late payments, the amount of the late fee and when it is charged should be documented. The payment processing address should also be listed here. An Ohio promissory note that is secured should include information about the collateral. If this information is not included, the court could ultimately hold that the note is unsecured and not secured. Interest Due in the Event of Default. This is the interest rate the borrower will be responsible to pay if they default on the agreement. Most Ohio promissory notes start with a lower than maximum interest rate. The maximum interest rate (or an interest rate higher than the initial interest rate but not exceeding the maximum) is applied if the borrower defaults on the terms of the loan. Payment Allocation. How payments made by the borrower will be split between the principal loan amount and the interest. Prepayment. If the borrower wants to pay the loan off before the end of the agreed upon term, they may be subject to a financial penalty. This clause explains whether such a penalty exists. Acceleration. The lender has the legal right to demand that the borrower pay the full remaining balance if the borrower does not comply with the terms of the agreement. Attorney Fees and Costs. When there is a legal disagreement over the Ohio promissory note, attorney fees and costs may be incurred by one or both parties. This clause explains how those costs and fees will be handled. Waiver of Presentments. This clause states that there is no legal requirement for the lender to be physically present when payments are made by the borrower. Severability. A severability clause keeps the rest of the agreement valid if one portion of it is found to be unenforceable. Conflicting Terms. A clause for conflicting terms explains how those terms will be clarified. Notice. Whether the lender will provide the borrower with notice if the lender sues because the borrower defaults on the agreement. Governing Law. A governing law clause provides the state whose laws will be followed if there is a disagreement related to the promissory note. There is no legal requirement in Ohio to have a promissory note notarized. To execute an Ohio promissory note, it must be signed and dated by the borrower. If there is a co-signer, the co-signer must also sign and date the agreement in order to be legally responsible to fulfill the obligations if the borrower does not.